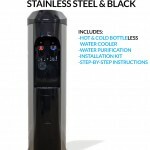 All BottleLess Direct water coolers come with a powerful water filtration system that is certified for 1,200 gallons. This system takes care of lead, chlorine, cysts, bad taste and odor reduction all in one commercial grade cartridge. 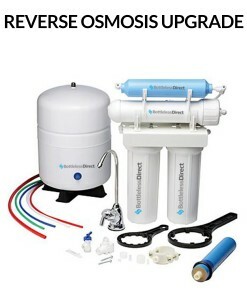 However, if you live in an area where there is higher sediment in the municipal water, you may want to consider upgrading to a dual-stage twist-off purification system. 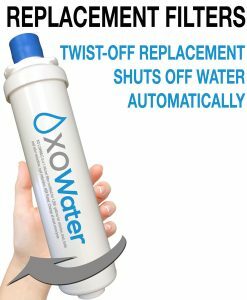 A Snap To Change The BottleLess Direct Twist-Off Purification System is the ultimate user-friendly filter on the market. Replacement of the cartridges takes seconds and a twist of the wrist. No drips. No hassles. 1,200 Gallon Capacity Our filtration is independently certified for 1,200 gallons of use for chlorine, lead, cysts, bad taste and odor reduction. That’s like drinking 240 of those big five-gallon bottles! Our filter has been tested to NSF performance Standard 42 and Standard 53. This dual system has the same certifications as the single cartridge, but has an added layer of protection. 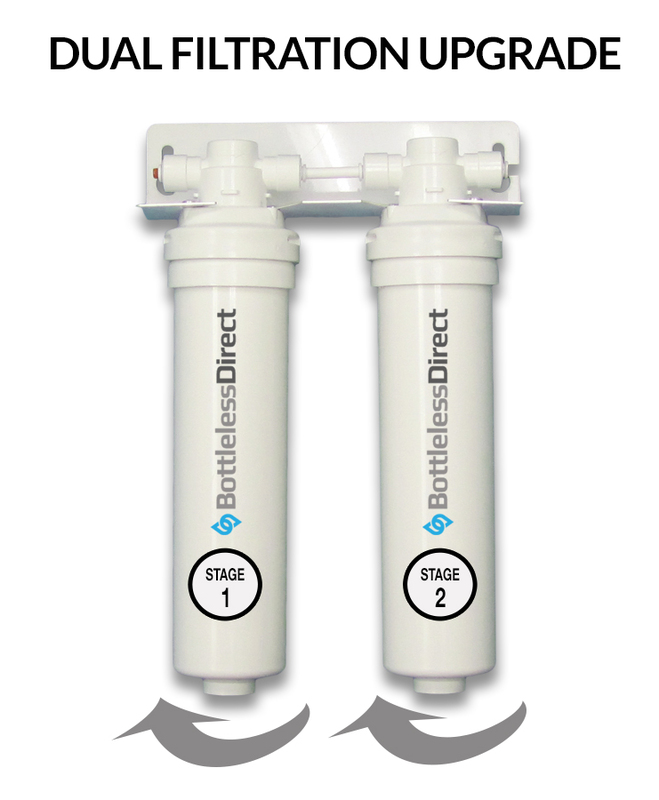 The first stage is a “pre-filter” which helps to protect the main filter for efficiency. The Twist-Off Purifi­ca­tion Sys­tem is the ulti­mate “user friendly” filter in the mar­ket. Replace­ment of the car­tridges is com­pleted in a mat­ter of sec­onds. 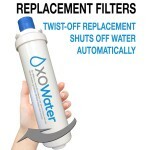 You just detach the filter cartridge from the per­ma­nent head with a 1/4-turn twist. The new fil­ter car­tridge is just as eas­ily replaced by thread­ing it into the head and twisting a 1/4 turn to the right. 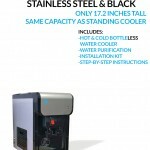 $69.95 Per Filter Change Our coolers are engineered to be maintenance-free. 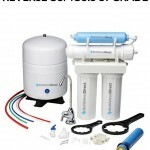 All you need to do is change the water purification cartridges. The cost? Only $69.95 per filter change – for both cartridges. Compare that to renting a bottleLess cooler! Delicious Water Our water filtration purifies the water that’s already in your building to bottled water quality. Our 1-micron water filtration is independently certified to remove bad taste & odor, lead, chlorine, & cysts. Your water will be pure and delicious. Our Micron Purification does not require a drain nor does it require electricity (just water pressure). You can learn more at our Water Purification page.